You don't have to take classes from a professional teacher to learn the art of Chinese cooking if all you want to do is to entertain your friends or cook for your family. Almost without exception, Chinese women learn this skill by watching and working together with their mothers or grandmothers. After they become wives or mothers themselves, the most diligent will try to improve their techniques by consulting cook books and exchanging experiences with their neighbors. In this way they eventually become as skilled as the best chefs in established restaurants. It should be noted, of course, that most of the well-known chefs in famous restaurants are men, because many men in Chinese homes are just as good at the art of cooking as their wives. 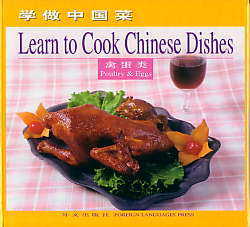 This book in the Learn to Cook Chinese Dishes series has been compiled by master chefs. They have used simple explanations to introduce the ingredients, the ways of cutting, and the cooking procedures for each Chinese recipe. Readers, who follow the directions, will before long become skilled in the art of Chinese cooking. The entire set consists of nine volumes, covering freshwater and seafood dishes, meat dishes, vegetable dishes, courses made from soy beans, soups, cold dishes, pastries, dishes of eggs and poultry, and recipes for family feasts. This volume introduces forty recipes of poultry meat and egg dishes. Poultry is a major category of raw materials for Chinese cooking. Fowl meat is more tender and has a finer texture than animal meat. Besides, it contains more valuable nutrients and offers specially delicious tastes. Eggs have even better nutrients and can produce a wide selection of dishes. The meat and egg recipes used in the dishes presented in this book all use domesticated chickens, ducks and geese. Chickens are raised for their meat, eggs or both. To cook chicken dishes, the ones raised for yielding meat are the best choice. Different dishes require chickens of different sizes and age. To cook "Sizzling Chicken", "Crispy Chicken" and "Stewed Tender Chicken", chicks several months old are used. To do " Stir-fried Chicken with Chili Sauce and Peanuts", "Spicy Shredded Chicken" and "Crispy Chicken", the meat from part of a chicken or a whole chicken of one year in age is called for. Chickens older than a year may be more nutritious and tasty, but the texture of its meat tends to be tougher and therefore not suitable for stir-frying. Usually such chickens are used either whole or in large pieces to be cooked or stewed with heavy seasonings. Examples include "Braised Chicken Chunks with Brown Sauce" and "Stewed Chicken with Gingko Fruit". Ducks range from those that are force-fed and those that are naturally fed. The first category are larger in size and their meat is tender and fat, making them ideal meat for duck dishes. They- can be cooked whole to make "Roast Duck" and "Stewed Duck in Ear-then Pot", or cut into chunks to make "Braised Duck with Green Tea". Alternatively, chunks of meat can be taken from the duck to make " Quick-fried Shredded Duck with Scallions" and "Braised Duck Slices". The naturally fed ducks yield both meat and eggs. Their meat is fine in texture and tasty. Such ducks can be cooked in whole or cut into chunks to make dishes such as "Crispy Duck" and "Duck Stewed in Clear Soup"
Goose meat is comparatively tougher and rougher than chicken and duck meat and therefore can produce fewer dishes. But "Roast Goose" and "Goose with Bean Paste" made with a whole goose are choice dishes on any Chinese menu. Eggs are a major ingredient in Chinese cooking either for making pure egg dishes or for combining with other ingredients. Chicken eggs are used most often and the pure chicken egg dishes include "Five-flavored Egg with Tea", "Egg with Brown Sauce" and "Fluffy Egg". Together with other ingredients, they can make dishes such as "Egg with Tomatoes", "Egg Rolls" and "Egg Dumplings" - Eggs can also be used as a binder in other dishes. Duck eggs are employed to make " Hundred- year- old Eggs", preserved salty eggs and eggs preserved in rice wine sauce. Goose eggs are less often used in Chinese cooking because of their rough texture.